Mango, avocado and shrimp salad | eat. live. travel. write. One of my favorite summer salads – the kind that will make you want to eat any leftovers straight out of the container standing in front of the fridge after the party’s over – is so simple, so delicious, and so visually appealing that I promise you are going to want to make it tonight. Really, it’s that good. And that easy. 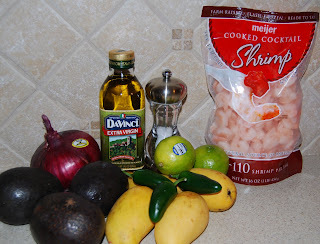 To dazzle your tastebuds and wow your family and friends, you will need a couple avocadoes, a few mangoes, cooked and cleaned shrimp, olive oil, a lime or two, a red onion, a few jalapenos, and a little salt. 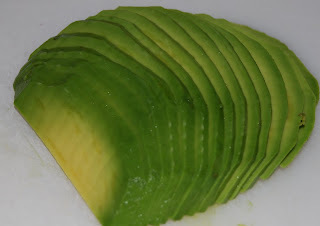 When purchasing ingredients for this, I generally tend to buy more avocadoes, mangoes, and limes than I really think I’ll need because with these particular items, you just never know for sure what you’re going to find when you slice into them. The mangoes might be funky, the avocadoes might be brown, and the limes might produce little juice. For that reason, it’s good to have an extra on hand. And, hey, you can always make a little guacamole with the leftover lime and avocado, and who doesn’t like that? Also, with the shrimp – for a side salad, I generally use the small shrimp you see here; if I were making this as an entree salad, say for a lunch with friends, I’d use the much bigger, meatier guys. Your choice. These are definitely easier on the budget and just as tasty, so don’t feel obliged to use the fancy ones. Thaw your shrimp in the refrigerator overnight and drain them in a colander while you prep the dressing. 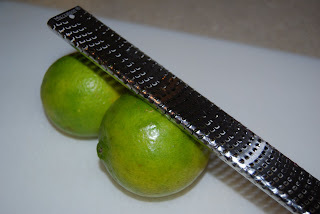 In a large bowl, zest one lime. If you have any junior cooks around the house, this would be a good time to enlist their help. My seven year old daughter, Charlotte, loves to help out in the kitchen, and zesting and juicing are two of her favorite tasks. Watch those knuckles with the grater, however. Speaking of graters, do you have a Microplane? If not, while you’re at the supermarket picking up the ingredients for this salad, pick yourself up a Microplane grater too. You will be glad you did. 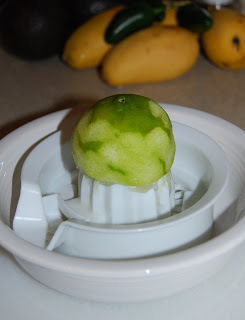 Once you’ve thoroughly zested your lime, juice it and add the juice to the bowl. 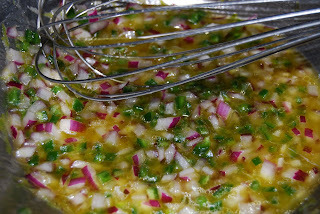 Splash in enough good olive oil to balance the lime juice and whisk together. 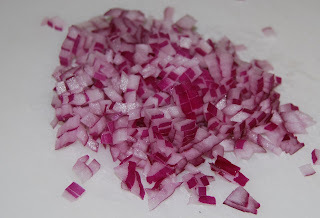 Now finely chop a bit of red onion – how much is completely up to your taste. Add it to the dressing. Wash, stem, and seed your jalapenos. I used three here, but they were quite small. If you are using larger ones, you might get away with just one or two. Also, and this is important, be sure to strip the jalapeno of all seeds and all of the white “ribs” inside the pepper if you are serving those with delicate tastebuds. 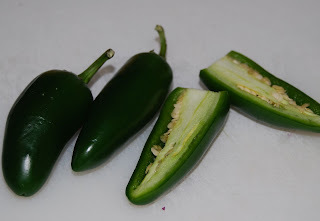 I happen to be spectacularly wimpy when it comes to heat in my food, so the poor jalapenos I use are basically green peppers by the time I finish with them, but again, adjust this to suit your own tastes. If you like spicy and want more heat in your salad, then by all means, keep the ribs and and toss in a few seeds to boot. It’s all up to you. Whisk this all together and grind a bit of salt into it before adding the cooked shrimp and mixing thoroughly to coat the shrimp.
. . . peel and slice them into relatively thin slices. We’re going to fan these out onto a serving platter, so you’ll want them to be thick enough to handle but thin enough that they don’t overpower the small shrimp. I like to use ataulfo mangoes for this salad for two reasons: they are generally in better shape than the standard mangoes in our local supermarket (the large green/red mangoes can often look lovely on the outside but be brown on the inside, not good if you don’t discover this until just before you need them), and they are string-less, which is nice in a salad like this. 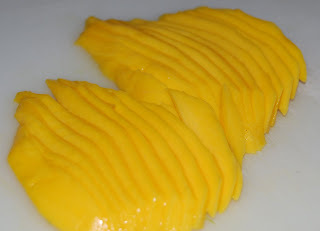 Choose mangoes that are not overly ripe, as you need them to hold up to slicing. Just as with the mangoes, choose avocadoes that are ripe but not overly so, as they will need to hold up to being sliced and arranged. Now fan them out onto your platter in some sort of pretty pattern. 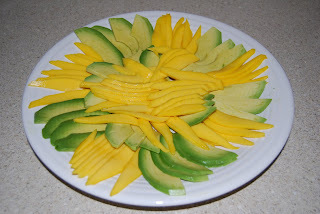 Let’s focus on how nice the edges look, and ignore the big pile of mango slices in the center, shall we? I got lazy. They’ll be covered in shrimp anyway, so it will be our little secret. 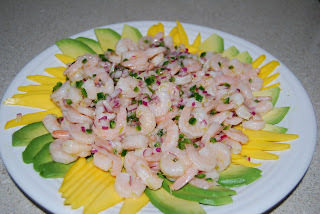 Now give those shrimp one last stir in the dressing, spoon them out into the middle of the plate, and you’re good to go. Enjoy! Mardi, once again, thank you so much for allowing me to share a favorite recipe with your readers! I hope that this will become one of their summer favorites too. Looks yummy Cathy! Might have to give this a try.